DashClock just keeps pulling in more and more extensions, making the lockscreen widget more and more useful. Since its release a few weeks ago, DashClock has crossed the 100,000 download mark (impressive for an app that can only run officially on 4 devices), and has had dozens of extensions. 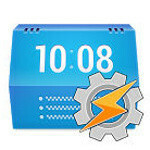 Now, we’ve got three new and very useful extensions for DashClock for Google Voice, GTalk, and Tasker. Both the Google Voice and GTalk extensions are what you would expect. In minimized view, you’ll get simple counts for messages received; in expanded view, you’ll get details on the last message received; and, tapping on the notification will launch you into either Voice or GTalk as necessary. Very useful if you use those apps with any regularity. The Tasker extension is the real prize, because as is the aim of Tasker itself, the extension really aims to boost functionality. We say “aims to”, because right now the extension is fairly basic, but the ultimate goal is to allow users to create your own widgets for DashClock. As yet, there is aren’t options for tapping a notification, but that is on the way. If you want to try out any of these extensions, you’ll need an Android 4.2 device and DashClock, then just head to the Play Store to grab the Google Voice, GTalk, or Tasker extensions.